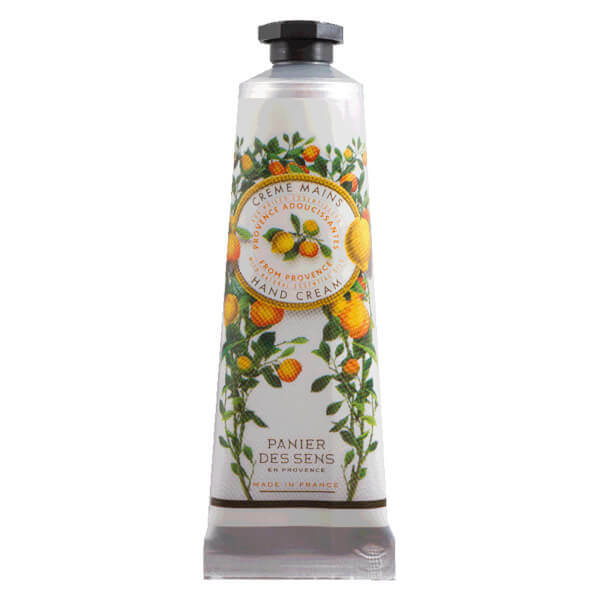 Soothe and pamper skin with Panier des Sens The Essentials Provence Essential Oils Hand Cream; a delicately scented formula that leaves hands feeling smooth and supple, without greasy residue. Enriched with 20% Shea Butter, the deeply nourishing cream softens and conditions hands, whilst enveloping them in a luxurious fragrance derived from Lemon, Cypress and Artemisia Essential Oils. Housed in beautifully decorated packaging. Aqua (Water), Butyrospermum Parkii (Shea) Butter, Glycerin, Propylene Glycol, Cetearyl Alcohol, Olea Europaea (Olive) Fruit Oil, Glyceryl Stearate, Peg-100 Stearate, Ceteareth-33, Talc, Citrus Limon (Lemon) Peel Oil, Cupressus Sempervirens Oil, Artemisia Herba-Alba Oil, Parfum (Fragrance), Xanthan Gum, Polyacrylamide, Caprylyl Glycol, Chlorphenesin, C13-14 Isoparaffin, Ethylhexylglycerin, Limonene, Allantoin, Laureth-7, Tocopheryl Acetate, Linalool, Citral, Hydroxycitronellal, Citric Acid, Citronellol, Geraniol, Benzyl Benzoate, Sodium Hydroxide, Tocopherol.